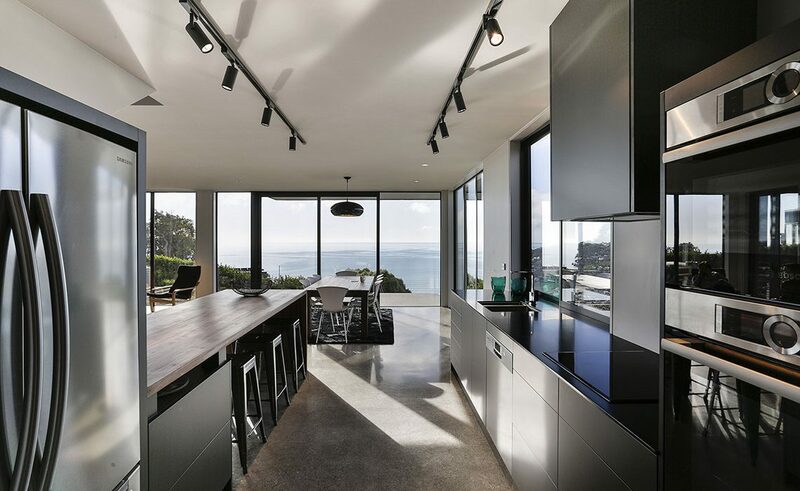 This modern, streamlined kitchen makes a bold statement without taking the limelight from the star of the show – the magnificent view. 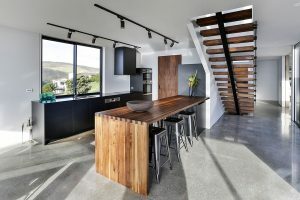 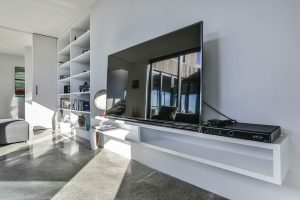 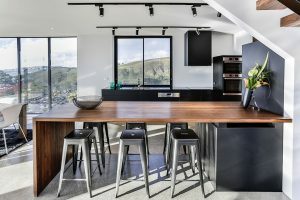 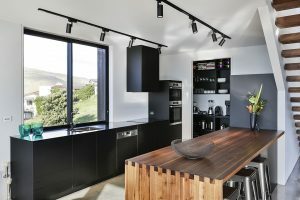 Designed to enhance its stunning location, high in the hills overlooking Sumner Beach on the outskirts of Christchurch, this home called for some delicate space planning and careful choice of materials when it came to the kitchen, says its designer, Larissa Breukelaar from Mastercraft Kitchens North Canterbury (Millbook Kitchens). 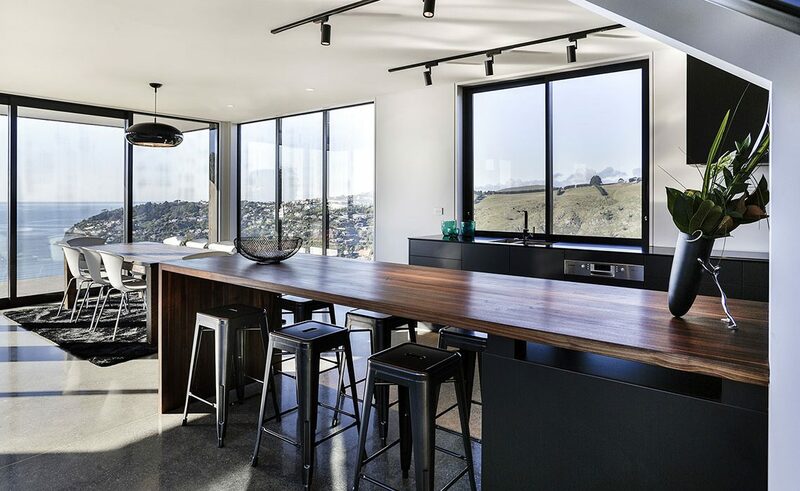 “Everything in this part of the house is minimal – it’s all about the views,” she says. 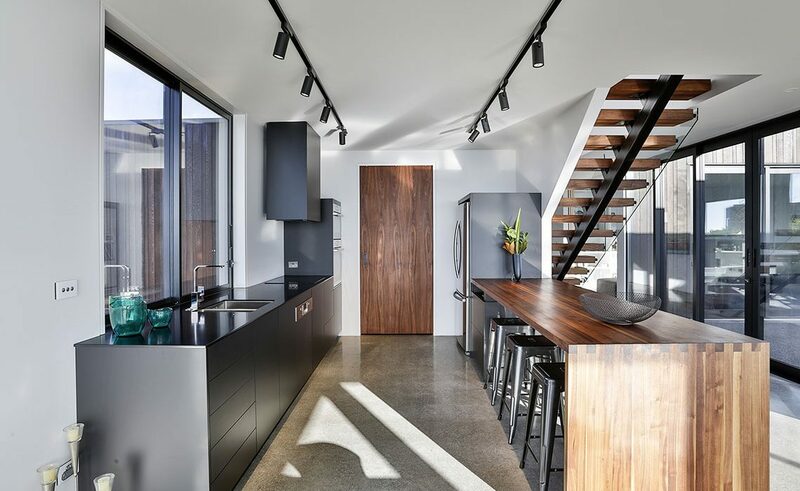 In keeping with the architecture and its interiors, the kitchen is simple and uncluttered. 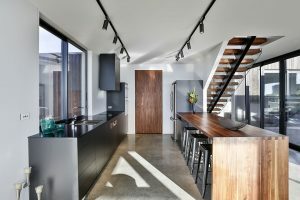 Elements have been given space to ‘float’ within the design – such as the rangehood cupboard hanging off from the ceiling, and the elegant transparency of the custom-designed, timber breakfast bar. The timber, a rich North American walnut, was the homeowners’ choice, says the designer. 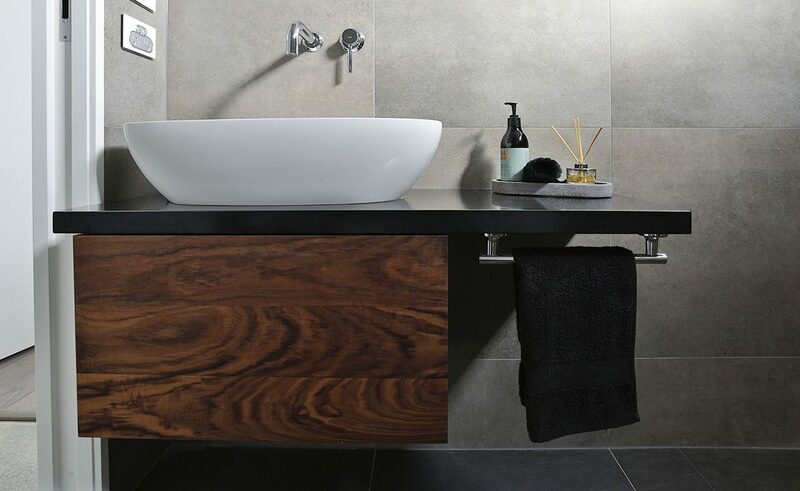 It gives the room some colour and warmth, and is also used in the open stair treads and scullery door. 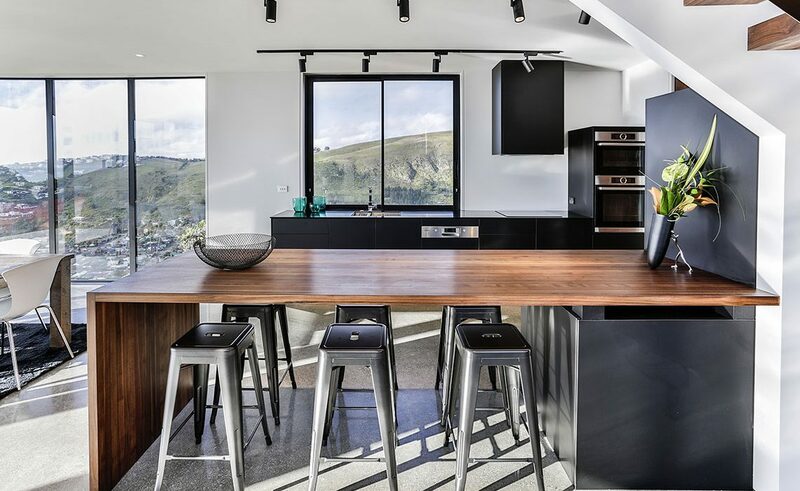 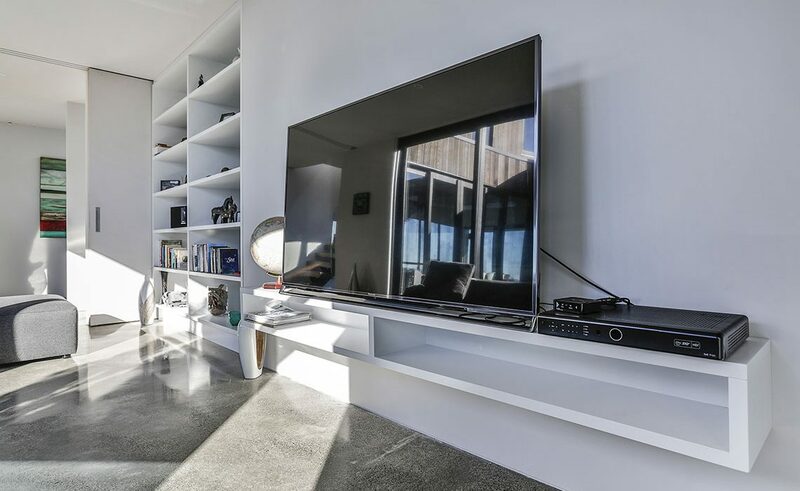 “My clients didn’t give me too much of a brief, other than mentioning they loved clean-lined designs and that they wanted matt black cabinetry,” says Breukelaar. 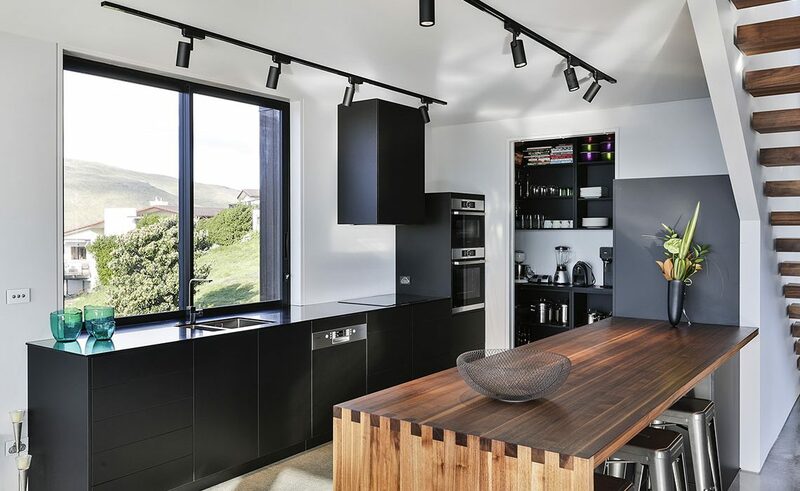 In response, the designer opted for a black-on-black combination of handle-less cabinetry and benchtops, using Luxe SuperMatt acrylic panels for the drawer and cabinetry fronts, because of its resistance to fingerprints, and Corian in Deep Nocturne for the work surface. 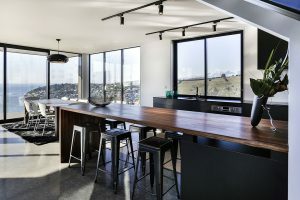 “The look and the feel of Corian is softer and warmer to the touch than stone – and because it has a slightly duller finish, the reflection from the view doesn’t blind you as much as if I’d used a highly polished stone finish. 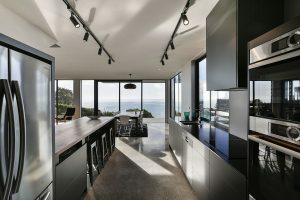 Also the thin, 12mm profile gives the minimal look my clients asked for,” she adds. 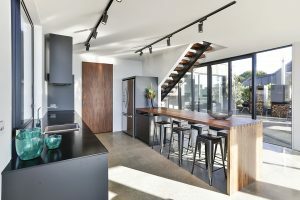 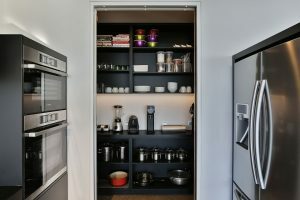 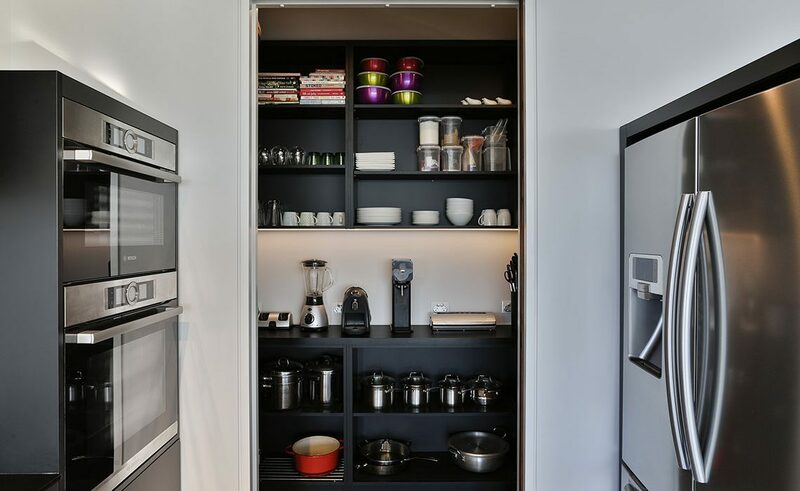 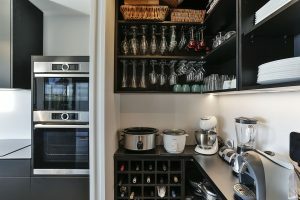 Black internal carcasses, a semi-integrated dishwasher, and a black-glass induction cooktop were also specified to complete the ‘all black’ look. 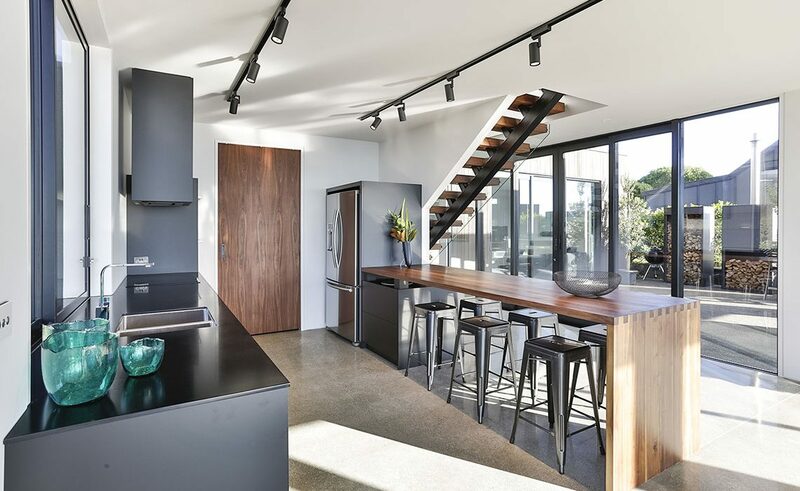 At the far end of the kitchen is a discrete scullery, containing a shallow, U-shaped benchtop and shelving – perfect for storing and using small appliances. 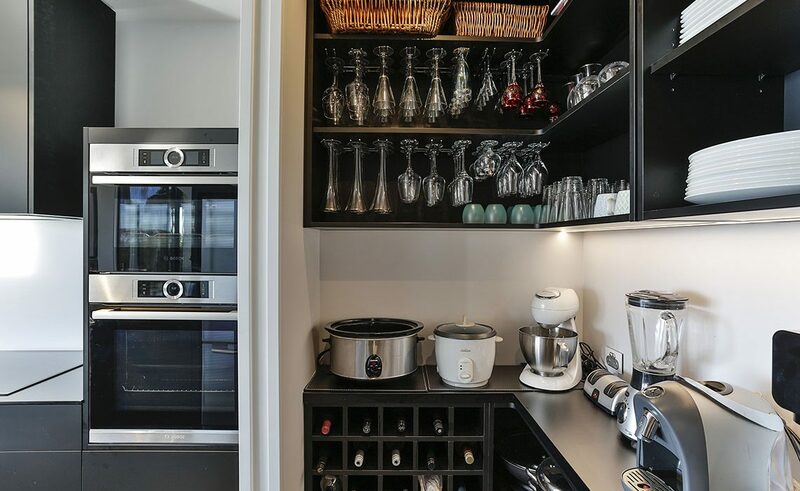 Within this small, but very useful space, the designer has also managed to squeeze in a below-bench, built-in wine rack, plus glass hangers above, which gives the look of having a mini bar.